We have worked with Jack & Lily before in the past on their Originals line. This was when my 3yr old was a baby. But now my 14m old has been wearing those shoes. They have great longevity and last a long time and they still look almost new. But he's quickly outgrowing them sinze they're a 6-12m so I was excited to try Jack & Lily's improved line of My Mocs. And we received the Kayden style in a 12-18m for my 14m old. I just love the style. They are SO darn cute! Best I can do for action shots! He's a busy boy! LOVE the grip on the bottom! PERFECT for new walkers/runners! I do find that their shoes run a little bit small. Their size chart for the 12-18m says US size 5-6 and 5.5". Liam's in a size 4.5 shoe wit feet around 4.75" and these are tight on him, even without socks on. But I think his feet are just chubby. Overall the shoes are great though. 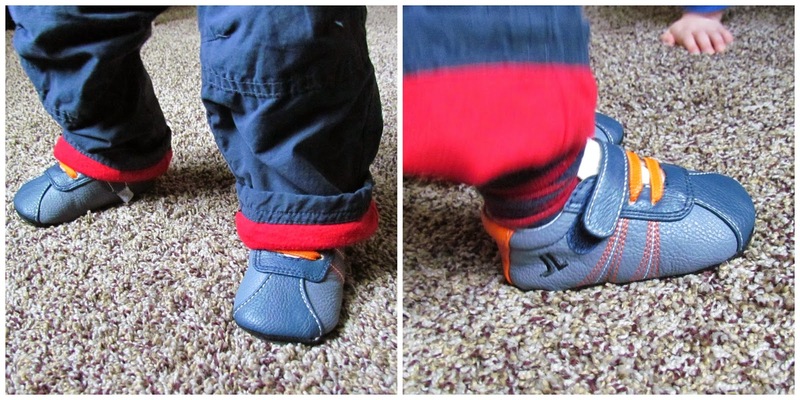 They stay on his feet, they adjust easily with a velcro closure and I love the elastic to get his feet in easier. They are a great, durable quality and will last us a while until he outgrows them (which won't be too long unfortunately). So besides the sizing, these shoes are just perfect! Made with genuine leather they are breathable. Made with non toxic materials too which is great! BUT I have a 25% discount code! Use code MFT at checkout for the discount UNTIL April 1st! Overall: ***** just wish the sizing was a bit more accurate. Those are the cutest shoes! They look really comfortable! These are such cute shoes, and my little nephew would look so adorable in these soft look shoes. What cute shoes these are! I especially like the lil' mice ones, those are really adorable! I've never heard of Jack & Lily before. What cute shoes! Thanks for sharing! So adorable! The Spaceship ones would match the cloth diaper from Ecoable! Sad day! I really liked their old style sole!